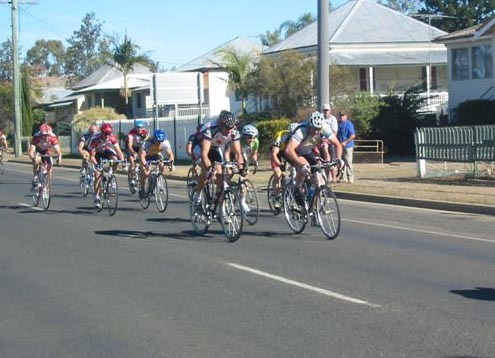 TEAM DALBY: "Charles Coin Classic"
The Charles Coin Classic was held at Laidley on Sunday July 9th in perfect conditions . However, the sun was not the only thing shining in the small town with some spectacular racing across all of the grades. The 13 kms circuit had plenty for all with some small slopes that seemed to get longer with each lap and some fast flat runs to keep the race pace high. The University Cycle Club hosted the event and, together with sponsors Pensar, HP, Planet Cycles, Merlo and Connor O'Meara Solicitors, are congratulated for their efforts which produced a successful day of SEQ racing. Masters C - Luke and Nolesy lined up for the 78km race against a large field of vets and some very strong elite woman.Luke managed to get involved in a 15 man breakaway which was sucessful.He came 3rd over the line, which is his best result for the season. Nolesy came home strong doing heaps of work leading the peloton with some other Bikeline Team riders. Elite C - Brady entered the Elite C 104 km race.About 30km into the race a small 7 man breakaway containing one of Brady's team mates, Asher Andrews got a large gap on the field and was looking like staying away for the entire race.However, some hard work by the Balmoral and Uni teams slowly but surely pegged away at their advantage and the peloton was back together at around the 80km mark. Plenty more attacks came from the pack to no avail, and the peloton came down the home straight together for a bunch sprint. Brady came over the line in 3rd place with two Sutton Fresh Sport team riders 1st and 2nd.